The goal is to provide an **overview of event formats**, with bite-sized descriptions and value propositions to participants. Many of these formats can be combined; many of them already offer abundant materials and case studies. For the remainder, there is work to be done to improve and support the format. Smart people like Dan Sinker, Brett Gaylor, Jess Klein, Ben Moskowitz, and Chris Lawrence & the Hive team, are leading the way to shape web-making activities for Mozilla that are compelling and valuable. Together we will **continue hacking on this event menu** and additional materials to improve these activities and make them more accessible to communities around the world. * [The Hackasaurus Hacktivity Kit](http://hackasaurus.org/en-US/educators/), a colorful guide bursting with lesson plans, IT checklists, and lots of helpful advice for hosting your own hack jam and using Hackasaurus’ simple tools to explore and remix the web. Jess Klein and Atul Varma have been testing and building the kit, which launched in beta in November. 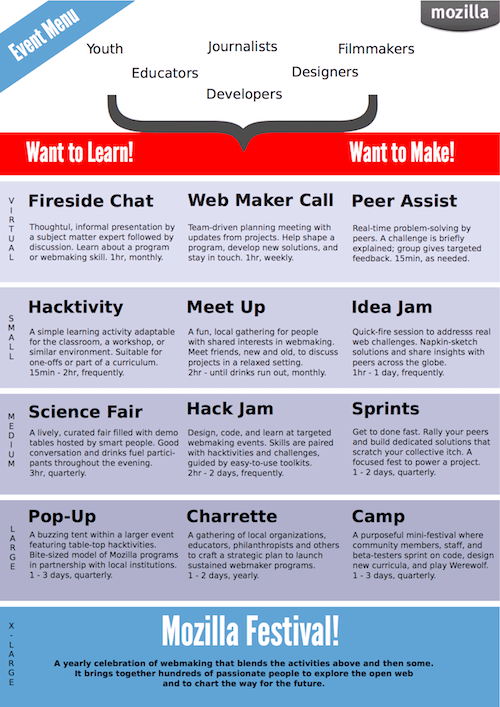 * Virtual events, such as Fireside Chats (like the [one held in December](http://michellethorne.cc/2011/12/fireside-chat-starting-a-learning-network-in-your-city/) by the Hive Learning Network NYC) and the weekly [Web Maker Calls](https://wiki.mozilla.org/Webmakers/Community_Calls). Virtual events are easy to organize, cost-effective, and transcend geography. Increasingly, I see them as efficient ways to scale meet-ups without breaking the bank or much logistic hassle. * Tried and true formats, like the [Mozilla Science Fair](https://mozillafestival.org/program/web-media-science-fair/) and [Pop-Up Experience](https://mozillafestival.org/program/london-hive/). These event-types have been deployed in a number of places and allow for quick yet compelling curation. They fit easily into larger events, and they can be mixed & matched to address participant interests and availability. * Value, value, value. The biggest lesson learned from Gunner, event facilitator nonpareil, is that **an event must always deliver value to its participants. ** What is it that a participant aspires to achieve? How are they getting value out of the experience? What is the motivation and return for investing precious time and energy? Slowly, the value proposition is beginning to emerge in the Mozilla Foundation event model. Yet it is in constant need of evaluation and revision. **Value is a guiding principle; it is a question one must ask at every step. ** Your thoughts are very welcome and very needed! Some helpful feedback already from Jess: should add a layer for training events. She runs an Ambassador training program, and I also hope to run a facilitator bootcamp before the 2012 Mozilla Festival. So, will definitely have to work that in. That’s a great work and the events matrix looks awesome. Love to see things like Charette (that could be a nice, more evolved local Melt :) ) and Idea Jam. Anyway, I assume that making Moz. communities around the world (old and new) adopt those events formats would need a bit of work, so I would also add local community organizers best practices workshops or facilitators trainings anually or twice a year (those could be more medium, 10 – 20 people). This is a great visualization of the different types of events (vertical axis) and its possible levels of engagement (horizontal axis). What I am missing is additional groups of people in the north of the figure, i.e. the group of people interacting in these Mozilla-hosted events. You include the people who are directly targeted by the three tenets of Drumbeat: Education (Educators & Youth), Journalism (Journalists, Video (Filmmakers) and the most essential cross-functional roles such as Design & Development. However, an additional “catchall” category seems to be missing. I thought of “Mozillians” but this might scare new people away. So what do you think about adding the term “web citizens”? In my opinion “citizen” points out that you are more than a lean-back consumer of a walled-garden internet. You are a person who aims to take charge of his/her own fate. Who is or aims to become a “mature citizen” (auf Deutsch “ein mündiger Bürger”) of the Internets. I think there are a lot of people who fall into this group and who should be targeted to become involved with Mozilla Drumbeat.